Agnes Conway (1885-1950), a writer, historian and archaeologist, and a student at Newnham College Cambridge between 1903 and 1907. Although studying ancient history there, she also took extra lessons in Greek with acclaimed classist and Newnham Lecturer in Classical Archaeology Jane Harrison. Conway went on to study archaeology as a student at the British School at Rome and the British School at Athens before the First World War. She took a detour into Museum curation during the war, serving on the Women's Work Committee of the newly established Imperial War Museum from 1917, and continuing this work after the war. A passionate traveller and photographer, in 1917 she published a book A Ride Through the Balkans: On Classic Ground with a Camera, detailing her journey through the Balkans as a British School at Athens student. After the war, she began serious study of 16th century British economic history at the Institute of Historical Research, but continued to maintain her interest in travel, archaeology and photography. She travelled to the Middle East for the first time in 1927, visiting Egypt, Palestine, Transjordan (including a trip to Petra), Syria and Iraq. In January 1932 she and George Horsfield (q. v.) were married in Jerusalem. Thornton, A. 2014. In the Lens: George and Agnes Horsfield's Photographs. Micropasts Project blog. 8 September. Thornton. A. 2018. Archaeologists in Print: Publishing for the People. London: UCL Press. 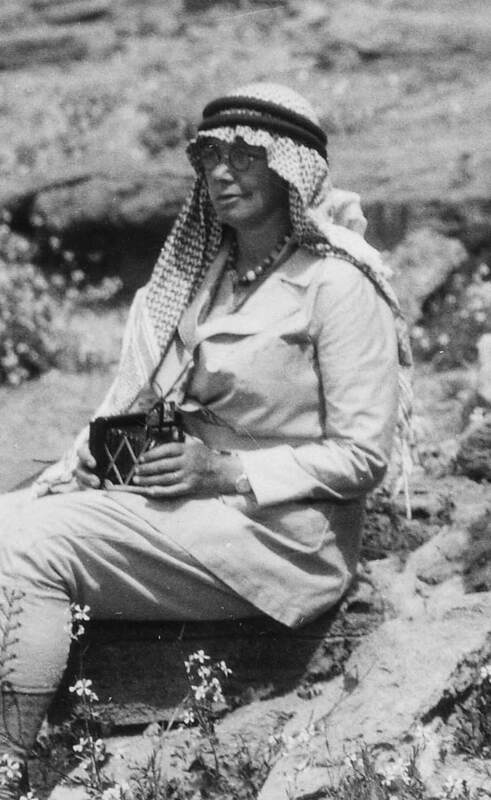 Agnes Conway Horsfield, camera in hand, in Transjordan, 1930s. Copyright UCL Institute of Archaeology. George Horsfield in Jerash, c. 1924. Copyright UCL Institute of Archaeology. George Horsfield (1882-1956), an architect, trained in Gothic Revival style, formerly of office of George Frederick Bodley in London and the United States firm Cram, Goodhue and Ferguson. After service in the First World War, Horsfield obtained admission to the British School of Archaeology in Jerusalem for the 1923-4 session. At the end of the year he was sent to Transjordan to begin conservation and restoration work at Jerash, becoming eventually Chief Inspector (sometimes referred to in contemporary British documents inaccurately as Director) in the Transjordan Department of Antiquities. Horsfield was based in Jerash during this period, though frequently travelled in the region. During the first years at Jerash, he trained a small group of Circassian men, including Ali Burar (q. v.) and Mahmud Charish (q. v.) to help with the archaeological work – these men directed the excavations at Petra when Horsfield was elsewhere on site. He married Agnes Conway (q. v.) in 1932. (Christian) Ditlef Nielsen (1874-1949), a Danish scholar working in the University of Copenhagen's Library, Nielsen was interested in comparative ancient religion and religious practice, and inscriptions. He presented his research on Petra as the location of Biblical Mount Sinai at the International Congress of Orientalists at Oxford in August 1928. He wanted to look for inscriptions, and it was arranged at Oxford that Nielsen should join the Petra team. Nielsen also suggested that Tawfiq Canaan (q. v.) join the party. Agnes Conway (q. v.) translated his Congress paper from German to English for submission to the Congress Proceedings (1929). Nielsen also published his research on Petra as Biblical Mount Sinai in the Journal of the Palestine Oriental Society. 1929. Proceedings of the Seventeenth International Congress of Orientalists Oxford 1928. London: Humphrey Milford. Bourmaud, P. 2012. "A Son of the Country": Dr. Tawfiq Canaan, Modernist Physician and Palestinian Ethnographer. In M. LeVine & G. Shafir, Struggle and Survival in Palestine/Israel. Berkeley, CA: University of California Press. Nashef, K. 2002. Tawfik Canaan: His Life and Works. Jerusalem Quarterly 16. Schwake, N. 2014. The Great War in Palestine: Dr Tawfiq Canaan's Photograph Album. Jerusalem Quarterly 56. Ali Burar in Petra, 1929. Copyright UCL Institute of Archaeology. Ali Burar/Burass, a Circassian from Jerash, who later had a salaried position in the Transjordan Department of Antiquities. During the course of the Petra work, he was responsible for overseeing parts of the excavation, and directing small trial excavations on site. Thornton, A. 2012. Tents, Tours and Treks: Archaeologists, Antiquities Services and Tourism in British Mandate Palestine and Transjordan. Public Archaeology 11 (4): 195-216. 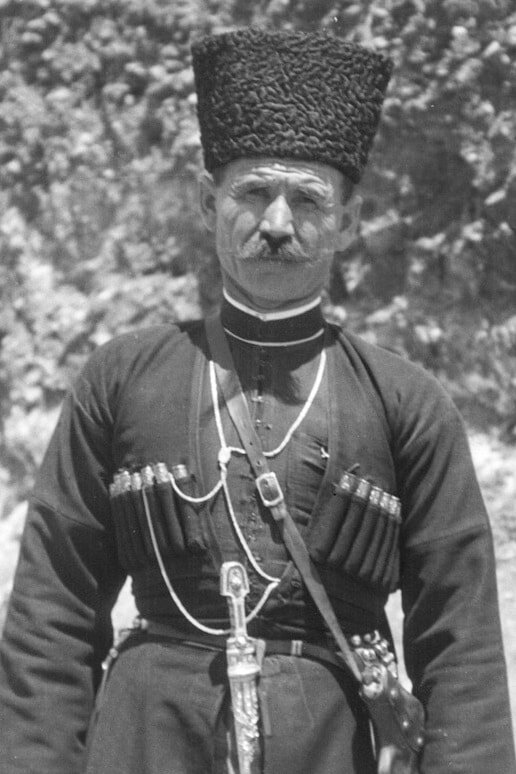 Mahmud Charish in his Circassian garments. Copyright UCL Institute of Archaeology. Arif Hussar/Nassar, one of the workmen on site, probably a Circassian. Osair, leads party to examine El Barid. Deifullah, "night watchman and general go-between"
Huaymil, "wood and water fetcher"
Henry Mond (1898-1949), an industrialist and politician, chief funder of the Petra Excavation Fund. Mr Head, Reginald G. Head, later an Assistant Inspector in the Transjordan Department of Antiquities. Governor of Ma'an, given name Khalaf Bey Attel; Ma'an was the chief city in the administrative district. Mr Strange, Royal Air Force Intelligence Officer; an RAF base was located near Ma'an and RAF pilots were involved in taking aerial photographs of Transjordan and Palestine for intelligence at the time. Pere Antoine Raphael Savignac (1874-1951), French archaeologist based at the Ecole Biblique in Jerusalem. Pere Antoine Savignac taking photographs at Petra. Copyright UCL Institute of Archaeology. Sheikh Bashir, local community leader at Petra. Mr Johnstone, likely Jotham Johnson (1905-1967), a classical archaeologist associated with the Dura-Europos excavations. Johann Ludwig Burckhardt, Journeyed to Petra in 1812 and published his travel memoir with John Murray in 1822. Charles Leonard Irby and James Mangles, Royal Navy commanders who explored Petra briefly in 1818, their privately published memoir appeared in 1823. Alois Musil, explored Petra in 1896, published his findings in 1907; concentrated on the classical monuments, but visited other sites. Rudolf-Ernst Brunnow and Alfred Von Domaszewski, Professors who stayed in Petra in spring 1897 (ten days) and 1898 (two weeks). Mapped over 800 of Petra's monuments. Gustav Dalman, between 1896 and 1907 visited Petra a number of times, published his Petra research 1908 and 1912. Theodor Weigand, with the Deutsch-Turkishes Denkmalshutzkommando in 1916.